Apparently, there is a whole world of similarly-themed conventions and activities that pop up all over the country. Sure, I’d heard of Comic-Conand Dragoncon, but ConChord (which features music, and community tied to science fiction/fantasy fandom – aka filk), Loscon (Sci/Fi convention),Costume Camp, and the Klingon Assault Group were all news to me. The main talk I did was called “Bad Science in the Media: Can Paranormal Claims Be Tested?” and concerned the kinds of paranormal claims that are blithely accepted in the media all the time without being questioned or challenged. We see famous psychics, bogus products, and credulous news stories all over TV, radio, and the internet, but too few people know that most of these claims have been tested and roundly refuted. 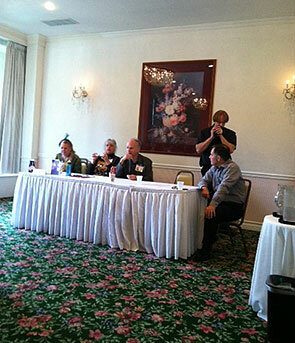 I also participated in two panels, one of which, “Science Denial: Distrust of Science and Scientists,” I moderated. On that panel, I had both San Diego State University physicist Calvin Johnson, as well as former rocket scientist Kevin Grazier on my side. A later panel I sat on was called “Out of Body Experiences,” which also dealt somewhat with near death experiences. There Judy Lazar, a PhD biologist, weighed in with her pharmacological expertise to counterbalance the New Age tone the discussion sometimes held. Though ConDor is the one-and-only sci/fi conference I’ve been to, the people seemed to be very friendly and generally pro-science – that is to say more pro-science than the rest of the population at large. I have no data to back that up, but I have been the only atheist or skeptic in the room enough times to know when the tide is against me. These folks at least had an appreciation for science. And why shouldn’t they? It fires their imaginations.